For some people, buying a mattress is done in a few clicks while others need to think about it a little more. Whether you are ready to buy now or later, choosing a mattress that you like is important to help you sleep better, especially when we know that we spend a third of our lives in bed! To provide guidance, we have prepared a buyer’s guide for mattresses, answering the 8 most frequently asked questions. The first thing to check before choosing a mattress is how much space you have to install it? A general rule is to make sure to test and measure your space to see what size fits your room and then define your options. The second rule is are you single, a couple or is the mattress for a child? This initial information will help you determine the size. Did you know that, on average, a person turns over 40 times a night? You wouldn’t want to be disturbed or to disturb your partner! Many couples opt for large sizes, such as Queen (60 “x 80 “) or King (76” x 80”), to be able to move around easily. For single people, the option of a double (54” x 75”x 10”) is probably the most comfortable. You even have the possibility of purchasing the single XL (39 “x 80” x 10 “), ideal for adolescents or average-size adults. For children, a single bed (39 “x 75” x 10 “) is perfect. 2. What type of mattress should I prioritize? Firm Mattress: Those who sleep on their back will love it because it supports your spine. Soft Mattress: Side sleepers will appreciate this mattress because it promotes blood circulation, even on the side. By buying a FLEEP mattress, you have these 2 comfort options (firm or soft mattress). How is this possible? By turning your mattress on one side or the other for the desired comfort adapted to your sleeping style. We believe so much in our product that we will pick it up at your doorstep free of charge if you do not see an improvement in your sleep in 111 days. 3. Does the thickness of a mattress have an impact on comfort? Yes and no! In the universe of foam mattresses, the ideal thickness is between 8 and 10 inches. But…you should also check the density of the mattress foams. It is this criterion that impacts durability and comfort. It should not be lower than 4lb/ft3. Furthermore, you should also know that high-density foam means that it has the capacity to return to its original shape night after night. Also, it keeps its properties that allow it to regain its shape for a long time, and thus, you will keep your mattress a long time! 4. Is the most expensive mattress the most comfortable? No! Although in general a foam mattress is a bit more expensive, there are still variations in retail prices. Also, buying a mattress directly online allows you to enjoy better prices. Because you are dealing directly with the manufacturer, you reduce intermediaries which explains a lower price than in a store for a same mattress or a comparable model! Where it is made and materials used will also influence the final purchase price! By purchasing a FLEEP mattress, you are getting a quality product superior to major brands and 100% made in Canada. In our creative process, we have optimized everything to be able to offer a quality and competitive product, compared to the price of equivalent products on the market. Our intention is to allow you to sleep better without breaking the bank! 5. What base should I choose for my mattress? Directly on the floor: FLEEP adapts to all flat surfaces. But beware of humid areas! Although you can install it directly on the floor, not all environments are suitable (for example in a basement). You should also choose flooring where temperatures do not vary. On a box spring: Your mattress sits on a bed base with slats spaced a maximum of 6 inches apart with a central support. Make sure the slats are not curved! They must be flat to ensure support for the mattress. Beware of box springs that are not designed to support a foam mattress. On a bed base: Lay the FLEEP on any platform or any bed base that is straight and flat. Suggestion: Ikea offers super nice ones at affordable prices. 6. Is a foam mattress more difficult to look after? Certainly not! The mattress cover is removable and washable. We know that an accident can happen quickly! For those with more foresight, anti-liquid covers are sold. With these, you will be certain to protect your mattress. 7. Are the mattress components harmful to health and the environment? No! However, one must remain vigilant when it comes to choosing a mattress. Check the components and certifications obtained. 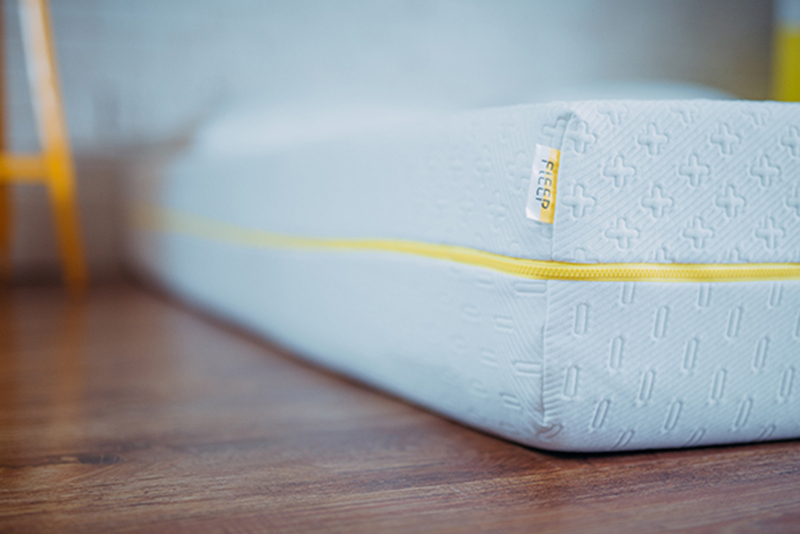 With FLEEP, you can choose a mattress designed with our foams without fear! They have an official environmental certification and are without risk to health. They are certified CertiPUR-US®. The foams, certified CertiPUR-US®, are manufactured without agents that harm the ozone layer, without PBDEs, TDCPP, TCEP fire retardants, formaldehyde-free and phthalate-free (regulated by the Consumer Product Safety Commission). In addition, the foams emit very little VOCs (volatile organic compounds) in ambient air (less than 0.5 particles per million). 8. What are the guarantees on my mattress? In general, guarantees differ for each merchant and manufacturers. Ask your dealer or find out in the section for this purpose on the websites of preferred brands. At FLEEP, we have no intention of offering less than our competitors. We offer a 10 year guarantee! In addition, because we have confidence in our product, we guarantee your satisfaction in 111 nights. And if you’re not sure of having made the right choice after this time, no problem! We will refund you and pick up the product right at your doorstep, free of charge! You can therefore choose a mattress with peace of mind! Are you still asking yourself questions concerning the purchase of your mattress? Did you know that you can talk directly to an online consultant and use our chat or visit our support section? Better still, take action now and discover FLEEP directly in your home!